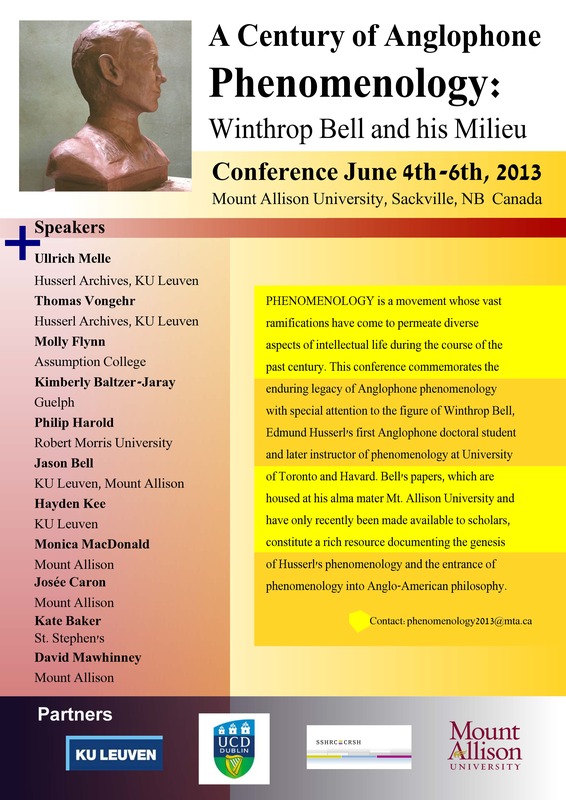 Here is a poster for the upcoming conference at Mount Allison, in honour of Canada’s very own Winthrop Bell, occurring 4 – 6 June 2013. The North American Society for Early Phenomenology announces their 2nd Annual Conference, Describing and Exploring Early Phenomenology, to be held at King’s University College, Western University, 12-14 June, 2013. NASEP invites all scholars to submit abstracts on any aspect of early phenomenology. This includes all philosophical investigations into the members of the Munich and Göttingen circles, their place within the early period of phenomenology (roughly 1900-1939), their relationship to other philosophers, and their contributions to the development of early phenomenology. The aim of this conference is to investigate the works of early phenomenologists across a broad range of topics, including ethics, mathematics, logic, aesthetics, politics, epistemology, ontology, psychology, etc. Figures covered include, but are not limited to: Edmund Husserl, Max Scheler, Moritz Geiger, Alexander Pfänder, Adolf Reinach, Carl Stumpf, Theodor Conrad, Johannes Daubert, Dietrich Mahnke, Hans Lipps, Hedwig Conrad-Martius, Wilhelm Schapp, Edith Stein, Alexandre Koyré, Jean Hering, Winthrop Bell, Maximilian Beck, Roman Ingarden, Dietrich von Hildebrand, Fritz Kaufmann, Theodor Celms, Aron Gurwitsch, Gustav Shpet, Gerda Walther, Wolfgang Köhler, Dorion Cairns, and Eugen Fink. We also welcome papers on the relationship between early phenomenology and the School of Brentano, Hermann Lotze, Theodor Lipps, the American Pragmatists, and the Neo-Kantians. Senior researchers and graduate students both are welcome to submit proposals. Graduate students should indicate their status in the email with their submission. Abstracts should be prepared for blind review, and should not exceed 300 words. Deadline for submissions: March 1st, 2013.